No matter what, it’s frustrating, demoralizing and difficult to overcome! What Does Being Overqualified Mean? Employers have a few big fears and concerns when hiring someone. One of the biggest is the fear that you’ll leave within the first year. You see, it costs a lot of time, energy and resources to hire you, train you, etc. It’s often weeks or months before you really start producing results for the employer, yet they’re paying your salary starting from day one. They’re also paying people to train you, supervise you, set up benefits/payroll with you, etc. It’s a big process and when they hire a full-time, permanent employee, they don’t want to have to repeat that process again soon. So often times, when they ask “aren’t you overqualified?” they’re just concerned you don’t really want this job for the right reasons, and you’re unlikely to stay for long. Along with that, they may worry your salary expectations are too high for what they’re willing to pay. Now, we can’t do a lot about that last one unfortunately… the only solution is apply to many companies, like any job seeker should do, and accept that a few might not want to hire somebody your age if you’re job hunting at age 50+. That’s okay! You only need to find one job, right? For all the other obstacles listed above, there are simple ways to put an employer’s mind at ease and quickly answer any questions about you being overqualified. The best way to get hired even if you seem overqualified is to address these issues upfront. If you think salary might be their concern, tell them that you understand that this position might not pay as well as some of the positions you’ve held in the past, and you’re okay with that. If you think they’d look at your resume employment history and be concerned about why you want this job, explain it in a cover letter and be ready to answer questions in your interview about this. Any time you’ve been a Manager or Supervisor in the past, and then you apply for an individual-contributor position where you won’t manage anyone, employers are going to be concerned about why you seem to want to take a step back in your career. You’ll often hear questions like, “aren’t you overqualified?” in scenarios like this. The key is to show them this is what you want to be doing, and you’ve put a lot of thought into this. Explain WHY you’ve made the decision to move into an individual contributor role. If you explain yourself well, they’ll be thrilled to have someone with your experience in that type of role! But you have to explain yourself. One great way to put their mind that you want their job at ease is show them you’re applying for multiple jobs of this type. Once you’ve decided to apply, it’s a good idea to address the fact you’re overqualified in your cover letter. Explain what you’re looking for, why their position caught your attention, and how you’d help their organization succeed. Make sure to spend extra time/effort showing them you’ve thought a lot about your job search, and why this job is the exact type of job you’re looking for. Here’s an article on how to write a great cover letter. You don’t always need to, but if you’ve been working for 20+ years, it can help curb age discrimination and get you more interviews. However, the most important thing is to tailor your recent resume experience to be as relevant as possible for the jobs you’re applying for. For example, if you’re a former manager looking to move into an individual-contributor role, you really want to emphasize the hands-on, direct work you’ve done recently, if any. Don’t emphasize management, leadership, and delegation because you won’t be doing any of that in your next job. You need to show employers what’s most relevant to THEM. And you figure this out by studying their job posting. Next up is the interview. If you’ve written a great resume and cover letter, you should start getting interviews even if you seem overqualified for the position you applied for. But the employer is still going to ask you about it in the interview, so be ready to answer questions about being overqualified. The tips and resources above will give you the best chance at getting a job while being overqualified. But nothing works 100% of the time. Some employers out there just will not want to hire you for their job, no matter how persuasive you are. They have a certain type of person in mind, and your background doesn’t quite fit that. But that’s okay. There are so many employers, and you only need one job, right? If you follow these steps, focus on doing things the right way, and keep repeating… you will find a job. So… Should You Apply for a Job Even if You’re Overqualified? Yes, absolutely. As long as it’s a job you want! Never let someone discourage you from applying for a position you think you’d perform well in. This is true whether you’re overqualified, or a tiny bit underqualified (missing one or two specific areas of experience, but qualified otherwise). You never know unless you apply. The only sure-fire way to NOT get the job is to not apply. 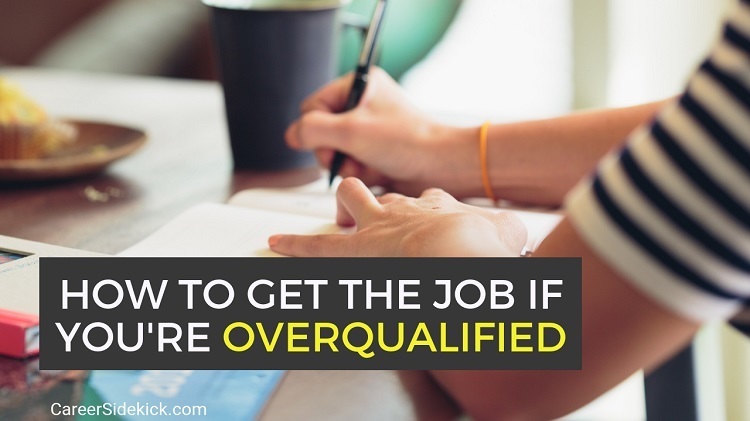 The post How to Get a Job While Being Overqualified appeared first on Career Sidekick.